The recipe was super easy - chop up onions, mushrooms and bell peppers; slice boneless skinless chicken breast. sautee (separately) with some extra-virgin olive oil and a little bit of garlic and pepper. For the dressing, heat some more olive oil and garlic in a small pan over moderate heat. Simmer garlic in oil to infuse the flavor; remove the garlic from the oil and transfer it to a small bowl. Wipe the pan and return to heat. Add balsamic vinegar. Raise heat to high and reduce vinegar by 1/2, 30 seconds. Stream the oil into saucepan and whisk to combine with vinegar. 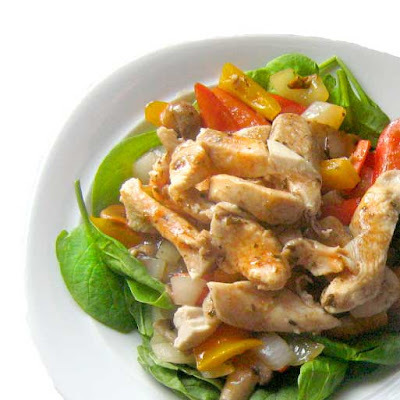 Put the sauteed veggies and chicken on a bed of spinach; drizzle dressing over the salad and season the greens with salt and pepper to taste. I've seen this recipe with goat cheese added - I didn't have any on hand so I didn't use any, but it'd be a nice touch too, I think! today: i'm babysitting liam, who is one super cool two-year-old that happens to be my second cousin. we're gonna kick it while his mom gets some her-time and like are gonna play on his backyard swingset so that he gets nice and tired out. this weekend: mike and i found a 100-house garage sale so that should keep us occupied for a few hours at least. after that, we're gonna hit up the markham ribfest (which i'd mistakenly thought was last weekend) with our friends rob and justyna, and then play the rest by ear. my mom mentioned wanting to take a drive down to st jacobs for the farmers markets, which would most definitely be something i'm also up for. I'm in complete agreement--my salads must contain a warm item. Must. Thanks for the recipe. Mmmm. Have a great weekend--100 houses? Wow! agreed! i love a slightly warm hard boiled egg, or potatoes on my salad! Oh that salad sounds delicious and it made me so hungry just reading about it! Thanks for sharing the recipe!! It all sounds wonderful! And I know what you mean about a cold salad. I definitely have to add something warm, or at least have some warm garlic toast alongside. i'm glad that everyone agrees with me! Ya know goes great with spinach? Some nice sliced Strawberries! I bet that would go great with chicken too! Where is this garage sale?? this looks so divine. i agree, there's only so much salad a girl can eat. that dish you cooked up looks great! have fun at the garage sale - 100 houses, whoa! that sounds like a great garage sale! wish i could go! 1. That salad needs to be in my belly now. 2. 100 house garage sale!! JEALOUS! Tasty looking salad! I agree, sometimes you need a warm salad so you don't feel like you're eating rabbit food. I'm jealous of the yard sale too! Sound delicious and can't wait to try it. This looks too good not to make it... I love a little something hot in a salad. This is definitely getting bookmarked. oh my, this looks delicious. hope you are having a lovely weekend. wow, this looks good! never tried spinach in salad, but this sounds so yummy! that yard sale sounds amazing! Hope you found lots of goodies. That salad looks delicious! Adding it to the list of things to try. How was the garage sale? I attempted this weekend, but there weren't too many to be found. 100?! Aaahhh. I want to hear about the garage sales!!! !